A boring table can take on a totally new and wonderful personality with a table skirt that goes to the floor. A skirted table can go into a bedroom as a bedside table or dressing table, a living room as a side table next to a chair or sofa, or as a festive dining table. Table skirts have many uses, and because they completely cover a table, the cosmetic condition of the table you use doesn't matter at all. A round, square, or rectangular table covered with a tablecloth makes a practical and inexpensive bedside table. Hide lamp cords and store books, tissue, or extra linens underneath. A skirted table in a dining room adds a wonderful air of luxury to a space. Keep in mind that the tablecloth might be in the way of chairs and knees. In order for the cloth to look good, set the chairs away from the table so the cloth can hang straight. For easy maintenance and daily use, place a piece of cut-to-order glass over the top. If you have a nice entryway, a skirted round table can be an impressive piece of furniture. Choose a beautiful bold fabric, cover the top with glass, add a vase of beautiful flowers, and use the table for mail, keys, and gloves as needed. If you have an extra bit of space in a bathroom, a skirted table can provide storage space and hide towels, shampoo, and other bath necessities. The standard height for a table is about 29 inches. Determine the best height by the piece of furniture near where it will be placed. A bedside table should be about as high as the mattress of the bed. A side table should be about as high as the arm of the chair or sofa. Pick up an old piece at a yard sale or flea market. Bring a piece of patio furniture into the house. A concrete or iron base with a plywood top cut to size is perfect. Make a table yourself to get the perfect size. You can buy a base and table round in almost any home center or lumber yard. For a square or rectangular table, cut the top from a piece of inexpensive 3/4" plywood. Screw legs into the bottom on all four corners. Once you've decided where you want to place the skirted table, what size it should be, and where you're going to find the base, it's time to think about adding the dressing. Choose subtle colors to help the table disappear into the corner or bold, beautiful fabric to create a focal point for the room. Purchase a large piece of felt that will serve as a cover for the table top and soften the edges when you add the table skirt. Select a color of felt that coordinates with the table skirt so it will not show through the final layer of fabric. Measure the size of the tabletop and cut the felt so that it extends at least 10" over the edge all the way around. Rectangular skirted tables look neat, tailored and more formal than a round table. For softness, place a box pleat at each corner. Add a glass top for convenience and added durability. 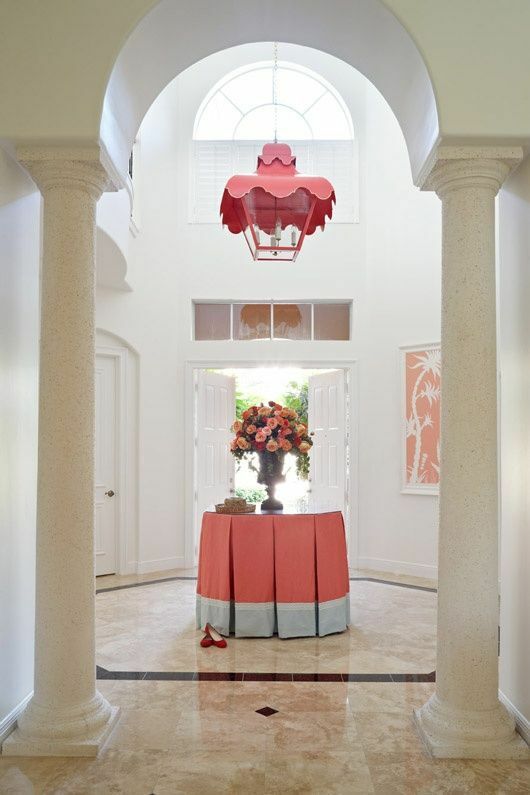 A drum tablecloth is a cylinder-shaped cloth that fits neatly over a round table. It has perfectly straight sides sewn to a top circle of fabric. This style is very tailored. For a more fitted tailored look, add pleats to the drum style skirt evenly spaced around the circumference. Trim with buttons or bows of matching or coordinating fabric. Silk, cotton, velvet, or upholstery fabric drape beautifully and hold their shape. Choose a solid color to add a block of color and texture to the space. Choose a plaid, check, or stripe for a neutral, but interesting, compliment to other patterns in the room. Choose a bold floral print to tie in with all the colors and other pieces of scale in the room. Carry over the main print from draperies, sofas, or the bedspread or coverlet. Select a sheer or lace fabric if your table base is a beautiful piece of furniture. For an airy look, layer two or more layers of sheer in different shades of the same color. The skirt will float lightly in the breeze and look delicate and airy. A topper is a separate tablecloth that goes over the top of a floor-length cloth. It is made of a coordinating or matching fabric and can be round, square, or fitted, with hems that are plain, corded, banded, or shaped into triangles or scallops. Add a band around the hem of the skirt using a contrasting or coordinating fabric. Make the inside panels of box pleats with a coordinating fabric. Stitch down the top 8" of each pleat with invisible or decorative stitching. Secure pleats with covered or decorative buttons or a bow stitched in place. Sew a band or two of ribbon near the hem edge. Stitch covered cording around the perimeter of the tabletop. Make the cover top a different fabric from the drop portion. A skirted table can really liven up a room and give it a simple and dramatic bit of punch. Color in a dark corner can light up a space. The skirt adds weight where other furniture might have bare legs. And the storage space beneath the table skirt is handy in almost every setting.